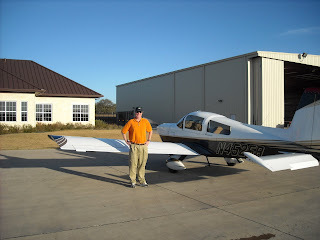 My co-owner took over and flew a simulated instrument GPS approach at Llano, Texas. The local Llano airport employee heard us make the call on the CTAF frequency and drove his golf cart down the runway to scare off the white tail deer grazing in harm's way. As we landed we could see him in the golf cart watching carefully for deer for us as we landed. What a great service! At dusk and dawn in the Texas Hill Country you must be very vigilant about deer on the runway. They love the grass around the pavement and often graze dangerously close to the runway. And the city of Llano has aviation fuel prices that cannot be beat. Today we fueled-up for $2.40/gallon for 100LL fuel. On the way back to Austin the sun went down and this is what our approach to Austin Bergstrom looked like.